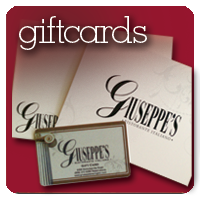 Giuseppe’s is now accepting reservations for New Years Eve! In addition to the above courses, small Plates may be purchased for $10. Reservations can be made on Open Table or by calling us at (859) 272-4269. A credit card number is required to secure your reservation. The credit card number is not charged except in the case of no-show, which will result in a credit card charge of $50 per person. If you need to cancel your reservation, you may do so without penalty by December 30, 2018. =Our chicken and veal dishes are served over a bed of spaghetti or with the vegetable of the day. two 4-ounce medallions of beef tenderloin, grilled to order, in an olive oil and garlic sauce, topped with shrimp. Winner of “Best Dessert” at Taste of the Bluegrass. Ladyfingers dipped in espresso, with whipped mascarpone cheese topped with shaved chocolate. A pastry shell filled with mascarpone and ricotta cheeses, topped with powdered sugar, chocolate chips & crushed pistachios. Our traditional Italian Ice Cream. Flavors vary by season. A blend of chocolate, pistachio & cherry gelato.